Cover any table with stylish sophistication. These tablecloths are available in 10 sizes of square and rectangular shapes: 23 x 23inch,50x 50inch, 52x 52 inch, 50 x 72inch, 50 x102inch, 52 x 70inch, 52 x 108inch, 54x72 inch, 54 x102inch, 54 x120inch. Featurg a variety of brilliant colors across the rainbow spectrum, our line of premium tablecloths offers chic, affordable flair for every holiday party or dinner. Enjoy hassle free cleanup with strong, durable, wrinkle and stain resistant polyester, while a 15" drop helps block spills from damaging your expensive tabletop, chairs and rug. Rectangular Shape. Whether indoors or outdoors, dress up your folding tables for a dash of decorative elegance. Durable Polyester. Never worry about ironing or dry cleaning again. Strong fabric material repels liquid, launders in the washing machine, and remains wrinkle-free for many years to come. The size of the tablecloth/table runners is 52 x 70 inch, etc. , the product is durable. Is a good home decoration tablecloth. Table cloth is Made from natural fiber - cotton / linen. Environmentally friendly digital printing. Stylish, avant-garde pattern. Creating a classic tablecloth. This is a new home Kitchen / banquet tablecloth. Features: soft, pattern and fabric perfect fusion, never fade. Resists wrinkles, machine washable, gentle cycle, line dry & won't shrink. 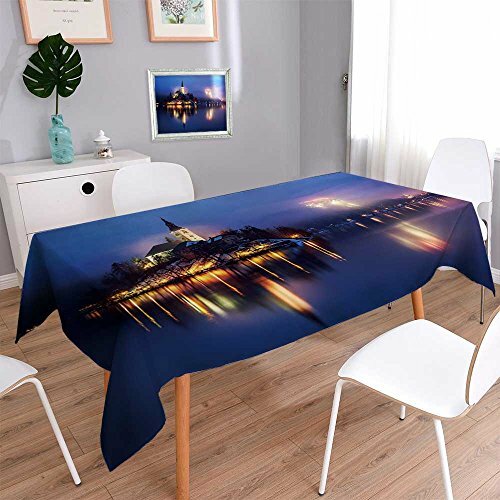 With this decorative tablecloth, you can easily dress up your table and help your family and friends enjoy the home, party, hotel, restaurant, cafe any occasion. Wipes clean with a damp cloth (recoAMMended), machine washable in cold water and gentle cycle, cold delicate, hand wash best,lay flat to dry. If you have any questions about this product by PRUNUSHOME, contact us by completing and submitting the form below. If you are looking for a specif part number, please include it with your message.